One of the girls arrested, Emily Wolfson, was one of my memorable Bat Miztvah students when I was Rabbi of Glasgow Reform Synagogue. After some rather “lively” teaching sessions with the bright and cheeky little girl, she ultimately hunkered down to work hard and performed wonderfully on the day. Her Grandfather proudly presented her with her tallit on the occasion. She continues to wear it proudly. Her strong affinity to Judaism and the Jewish community was, in part inspired by her Bat Mitzvah experience, and she continued to take part in Jewish youth activities, Jewish camps, and recently chose to leave the UK to spend a year in Israel as part of the Shnat programme. Naturally, her group attended the Kotel to experience it as an evocative, fascinating and emotional remnant of our history, and also as a place to pray. Sadly, the Kotel has now been appropriated by the Orthodox authorities who are exercising increasingly misogynistic control, and more and more extreme policies to ensure they keep this control. Their ultimate goal is to give less space to women at this holy place, and to accord absolutely no place for modern, progressive ways of observing Judaism. Consequently, as soon as Emily put on her tallit to pray, the Orthodox authorities present had her detained and dragged off to a police station, claiming the non-existent 'crime' of wearing a tallit. Read below the sermon I gave about the situation, and why I am calling on Rabbi Mirvis to demonstrate his public commitment to improving relationships by making a public condemnation of this arrest and the abuse of access to the Kotel which is being carried out by his colleagues in Israel, in the name of Orthodox Judaism. We all know that Christmas is coming up this week. Don't worry. I'm not going to spend my sermon time this week telling you how to either celebrate or not celebrate it. It's a statutory holiday, so you might as well enjoy it. I do have a few thoughts on inter-faith and intra-faith relations, though. A couple of years ago, I held a discussion with my congregation about the implications of Nostra Aetate during a time when we were marking one of its milestone anniversaries. This document signaled a ground-breaking change in the theology and policies of the Catholic Church. It retracted the outrageous accusation against all Jews that blamed us for causing the death of Christ, and it had been because of this alleged sin that the Church claimed the Jews had been rejected or accursed by God. This same document had been the result of years of change in relations between the Catholic Church and Jews that had been initiated by Pope John XXIII and his second vatican council of the 1960's. One of the most important moments demonstrating that things had changed forever was when Pope John XXIII, meeting for the first time with a delegation of Jews, uttered the words “I am Joseph your Brother.” The words were an intentional echo of those same words uttered by Joseph in this week's Torah portion of vayiggash. The encounter between Joseph and his brother comes after much cat-and-mouse game playing when Joseph realizes that his brothers do not recognize him. He plays with them, manipulates them, gets them to do some very painful things and even unjustly accuses them of robbery. Finally, right after his brother Judah gives his eloquent speech about family pain, loss and empathy for his father Jacob, does Joseph realize that his brothers have changed and that he can now reveal himself to them. It is at that moment that they “come close” (vayiggash), and he utters the phrase “I am Joseph your brother – it is me, whom you sold into Egypt.” Most commentators and analysts who examine the encounter between the Pope and the Jews interpret his words to be a statement about long-lost brothers. The Pope is, in a way, acknowledging his brotherhood with the Jews. Or that is at least how it has been seen. During my congregational discussion, though, one of my older, experienced, worldly and wise members said that she did not see it that way at all. She said his words were a kind of accusation. In saying that “it is me, whom you sold into Egypt,” Joseph is ensuring that his brothers know that this fact is uppermost in Joseph's mind. He remembers their treachery. Likewise, as this congregant interpreted it, the Pope is making a backhand accusation against the Jews who rejected Christ. If he is Joseph, then who are the Jews? Well, none other than the treacherous brothers who sold their own brother into slavery. Even if I don't believe her interpretation to accurately represent the Pope's intention, it gave me pause. It did not make sense that in the atmosphere of thawing relations and newfound common ground and harmony of the second vatican council, the Pope would find a subtle way to attack while seeming to embrace. But, at least in her eyes, how clever and canny it would have been for the Pope to use those very words of reconciliation to strike against the Jews, if that was what he had intended. It was a fascinating insight for me. I had grown up in the era of thawed relations, but she had lived through the second world war and the 1950's, and remembered them well from first hand experience. What it all boils down to, is that after centuries, even millenia, of mistrust and oppression, the Church could not make it all go away, make everything better, just because of a few changes in policy. Harmony, reconciliation and trust need to evolve and deepen over a long period of time. It does not happen over night. Speaking of reconciliation and trust, you are probably all aware that we have now been informed of the identity of the new “chief rabbi”. As I sometimes have to tell people, he is not my chief rabbi, but, well, nevertheless, we can examine it with our own perspective and with our own eyes as Reform Jews of Great Britain. Rabbi Ephraim Mirvis of Finchley Synagogue is to become Anglo-Jewry's 11th chief rabbi upon the retirement of Rabbi Jonathan Sacks. When asked how he would interact with other denominations, Rabbi Mirvis was quoted in the Jewish Chronicle as saying, “I would seek to have — hopefully — warm, friendly and constructive relationships with the heads of our sister Jewish movements.” A suitably vague, but hopeful kind of remark. Yet, sadly, I must note, particularly in light of events of the past week, that the reality that most of us experience is that the Orthodox branch of Judaism that he represents is actually becoming more and more extreme, and less conciliatory. When congregants tell me stories of Orthodox rabbis with specialist skills refusing to teach children that could benefit from their help merely because they belong to a Reform synagogue, or when Reform rabbis are not permitted to speak to children or even speak to teachers at a local school run under the auspices of the United Synagogue, or when Reform rabbis are refused the opportunity to speak on Orthodox-run cemetery grounds merely because they happen to belong to the Reform Movement, I rather despair of any real hope of friendly and constructive relationships. It seems that the Orthodox movement in this country becomes not particularly distinguishable from the Haredi groups that now seem to have successfully seized the Kotel. Indeed, I confess that it was one of my own former bat mitzvah protegees that was among the women arrested last week at the Kotel. One of my naughty little students with freckles and a rather cheeky grin is now, as she calls herself, an “ex-con”. Actually, I should correct that – she was among the teenagers detained last week at the Kotel. This time it was not for having the outrageous audacity to read or carry a Torah at the Wall. It was for the so-called “crime” of wearing a tallit at the Wall. Rabbi Elyse Frishman, one of the other women arrested, wrote of her ordeal being interrogated by police at a local police station after her detention. She wrote, “The “interrogator” asked if I knew why I was there. I said, “No.” She said, “You are not being arrested; you are being detained. You have broken a law; do you know that?” I asked, “What law have I broken? Wearing a prayer shawl is not against the law, Jewish or Israeli.” She told me that if I did not sign, I could be arrested. I knew this was not true, so I signed nothing.” Indeed, whatever you want to call it, detained or arrested, she was correct that the State of Israel has not yet put the crime of female wearing of tallit on the books and they did have to let them go in the end. But how long will it be before the State of Israel caves in completely to the minority Haredi extremists and does make it a crime? By the way, there was a lot of coverage of these arrests in the Jewish press. Not once did I see a comment nor a condemnation by the United Synagogue. 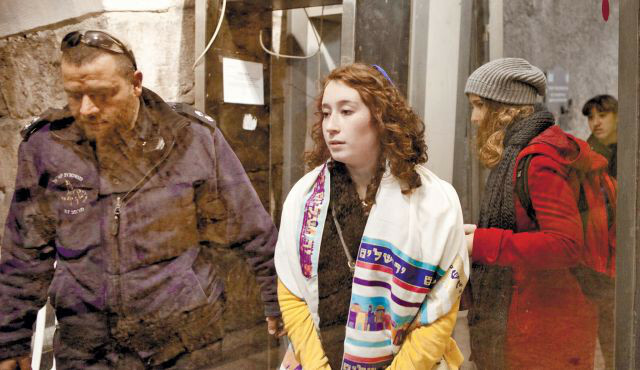 Has not one leader, rabbi, congregant, or eloquent voice of Orthodoxy seen the ludicrousy of arresting 18 year old girls for wanting to wear a prayer shawl while praying at one of our holiest sites, nor have they felt the slightest need to comment on it? Perhaps when the Chief Rabbi and his colleagues in the United Synagogue are prepared to condemn the outrageous mistreatment of serious, devoted young women wanting to wear a tallit, not a crime in either civil or religious law, only then will we see even a glimmer of a hope for warm, constructive relationships with our sister, (or should that be brother?) Movements. I would like to think that perhaps it was this accommodation, this first step at letting go that was in the background of Pope John XXIII's words all those decades ago. Perhaps he was able to realize that Catholics and Jews would not become best friends overnight, but at least, like Joseph and his brothers, we could come to some kind of accommodation, a place where we could live together again without the anger or burning resentment. It's perhaps now time for a Chief Rabbi to take that first brave step taken by the Pope over four decades ago. We progressive, modern Jews need, like that Jewish community of the 1960's, to hear a forward-thinking Chief Rabbi who does not just pay lip service to warm, friendly and constructive relation with the heads of his sister movements. We need to have him “come close” – vayiggash – show that he is truly serious about Klal Yisrael, the harmony and fellowship of the entire community of Israel. We need to hear him say to us that he is our brother Joseph – or are we his brother Joseph? – so that there will be hope for all of us Jews of the United Kingdom to be brothers and sisters again. Only then can we begin to accept him as someone worthy of the title Chief Rabbi of a truly United Hebrew Congregations of the Commonwealth.